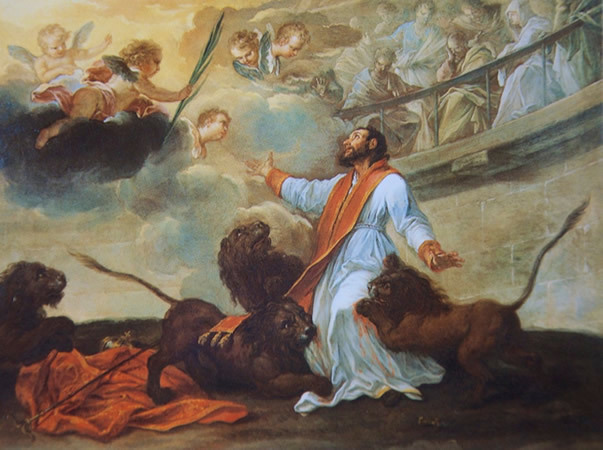 Home » Posts tagged "Saint Spotlight"
Today is the feast of St. Ignatius of Antioch who gave the church her name. When looking out at a group of disciples he said that this faith was Catholic, meaning universal. He realized that Christ’s beautiful bride in the church could not be stopped by different languages, cultures, or borders. It was all encompassing and ever growing. Besides giving us our name, St. Ignatius was known for spitting some hot fire. When the current emperor of Rome called him a wicked wretch he replied, “How can I be wicked when I have Christ in me?” When the emperor condemned him to death he praised the Lord saying, “I thank you, O Lord, that You have granted to honour me with a perfect love towards You.” He was also quoted with saying, “I would rather die for Christ than rule the whole earth,” and, “Do not have Jesus Christ on your lips, and the world in your hearts.” St. Ignatius of Antioch is a beautiful example to us that we should be overjoyed to unite our suffering with the suffering of Christ. We should all choose to be martyrs for our faith everyday, whether that means voicing an unpopular doctrine, loving the unlovable, or forgiving the unforgivable. Lift up your cross and unite your toil, your pain, you distress with that of Christ.